The past 15 years have seen tremendous progress in manganese chemistry, with the low cost of this metal making it an attractive choice as a functional group in organic syntheses. 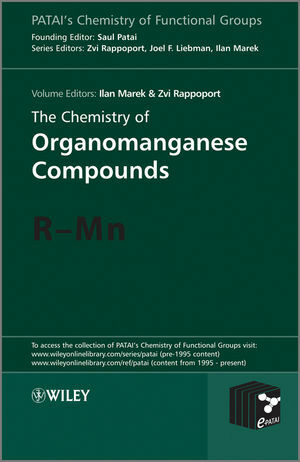 Surveying key compounds and reaction intermediates used in organic syntheses, this is the first volume in the Patai Series to focus on manganese in organic and organometallic chemistry. With contributions by leading experts, the book delivers the usual high quality of the Patai series. It also emphasizes novel applications in organic synthesis as well as technological trends in industrial, biomedical, and materials science. Professor Ilan Marek, Department of Chemistry, Technion — Israel Institute of Technology, Haifa, Israel. Professor Zvi Rappoport, Department of Organic Chemistry, The Hebrew University of Jerusalem,? Jerusalem, Israel.